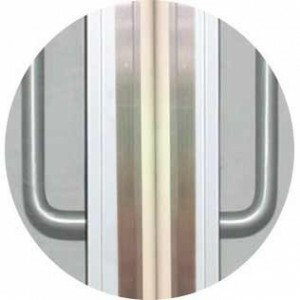 Made in America, Xcluder Pest Control Astragal Door Seals protect entry door gaps with a sturdy, 96-in. retainer and reinforced EPDM rubber gasket lined with Xcluder fill fabric, a patented combination of stainless steel and poly-fiber that is virtually impenetrable to rodents and other pests. The retainer, available in aluminum or bronze and a choice of adhesive or hardware application, can be trimmed to accommodate handles, locks and shorter doors. The Xcluder-lined rubber gasket is available in black or grey, and creates a durable weatherseal that often pays for itself in energy savings alone, the company says.